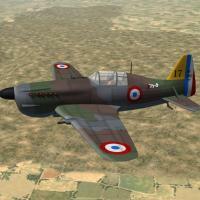 Some tweeks, fiddles and a new skin & decal set for Veltro's MS-406 French fighter. I've also substituted one of Stary's Generic Cockpits . See the 'Notes' section for full Change Log. The skin uses the SF2 'date switch', to turn automatically in July, 1940 (after the Armistace, and creation of Vichy forces). This is one of main reasons for the export/service editing, and additions to the Userlist. However, these changes ARE designed for use throughout the aircraft's service life. (although mostly for after the Armistice). As always, fairly easy to follow, yet detailed install instructions are included. PLEASE read them!! In fact, it's RECCOMENDED!!! that you read these instructions BEFORE installing (but after unzipping, of course) as you'll be backing up a few of the inis (for safety's sake, doncha know).